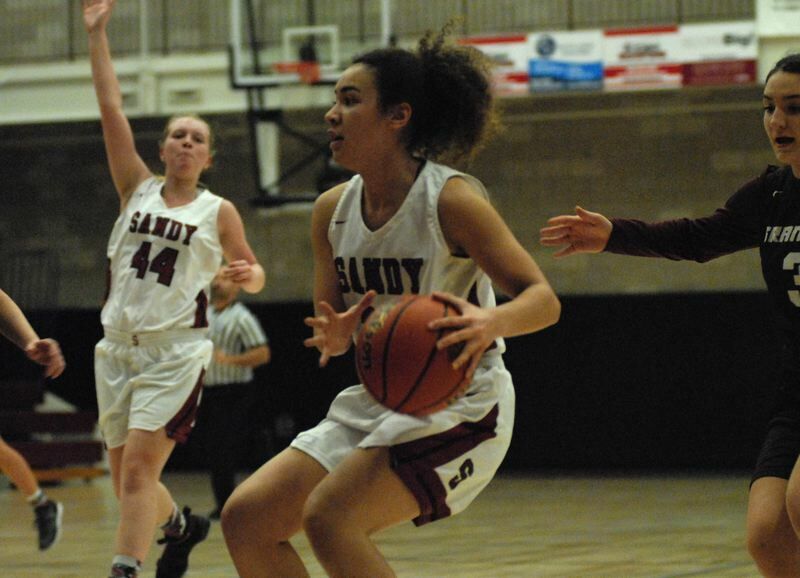 The Sandy girls basketball team led through most of the first half before seeing Franklin rush out of the halftime locker room to take a 46-35 win last week. The game started with a frenetic pace, but neither side could finish chances at the rim, leaving the scoreboard empty three minutes after tip off. Sandy eventually broke through when Athena Thomas sent a bounce pass through the lane to feed Brooklyn Adams for a layup. The Pioneers kept scoring when Bella Kansala drove into the lane only to swing a pass into the corner where Izzy Cabrera sank her second 3-pointer in a matter of minutes for a 10-7 lead at the end of the first quarter. The duo hooked up again to start the second quarter, but this time Cabrera passed up the long ball, took a couple dribbles and found Adams for a layup. Sandy highlighted the first half wen Kansala swiped the ball out of the hands of Franklin's Nykole Jackson and immediately fired a deep ball the length of the court for Thomas, who in turn sent a bounce pass across the lane that left Gentry Turin with an easy layup. The Pioneers built their biggest lead when Cabrera got open outside the arc once again. By now Franklin was well aware of her shooting ability, and Shaydee Gunnell flew at her in an attempt to block the shot. Instead, Cabrera paused a moment, waited for the defender to flash past, then swished her third 3 of the half to put Sandy up 20-15. Franklin moved on top early in the third quarter when Oby Nwokoma hit a 3-pointer following a Sandy turnover. 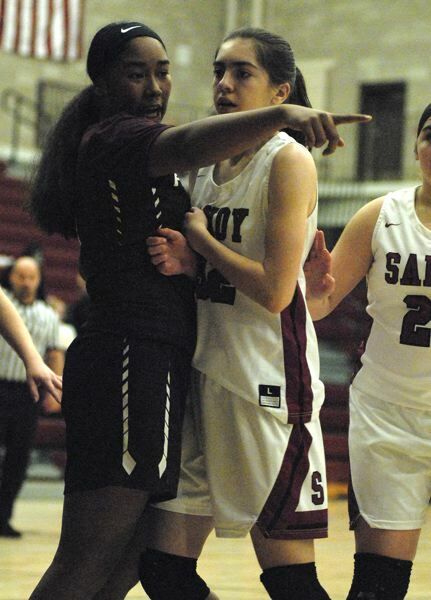 The Pioneers tried to battle back when Kansala swiped a steal in the backcourt and made a quick toss inside to Adams. She was fouled on her way to the basket and sank one of two free throws. Sandy had several chances to regain its lead late in the third quarter, but couldn't get a shot to drop through the net. Franklin found its shooting touch with 3s by Christy Nguyen and Jackson on back-to-back possessions to take a 32-25 lead into the fourth quarter. The Quakers stretched it to a double-digit margin when Gunnell connected from deep early in the fourth. Cabrera hit a runner in the lane to bring the Pioneers within seven as the clock dipped under two minutes, but that was as close as Sandy would get. The Pioneers compete at the Century High holiday tournament Thursday through Saturday with games against Sunset, Aloha and Newberg. Franklin (46) — Shaydee Gunnell 12, Christy Nguyen 11, Carmen Fiarito 9, Oby Nwokoma 7, Monique Lyons 2, Nykole Jackson 2, Eleanore Courcelle 2, Katie Pettit 1, Homme, Holmes, J. Nguyen. Sandy (35) — Izzy Cabrera 11, Brooklyn Adams 10, Bella Kansala 6, Athena Thomas 4, Tana Dwyre 2, Gentry Turin 2, McCrea. Dobson, McNutt, Dukart. This story is slated for our Dec. 26, edition.